Salmon has a sense of occasion about it. It brings a little bit of luxury to a meal despite the fact that it is a very healthy option, especially when served as part of a main course salad. Its delicious rich meat needs very little added to it, so can be cooked very simply, and it partners well with all the salad leaves, especially iron rich watercress and peppery rocket. In this recipe the salmon is poached in white wine and water with herbs and seasoning, as the healthiest option, but if you prefer you can quickly pan fry it in butter for an extra bit of crispiness and flavour. 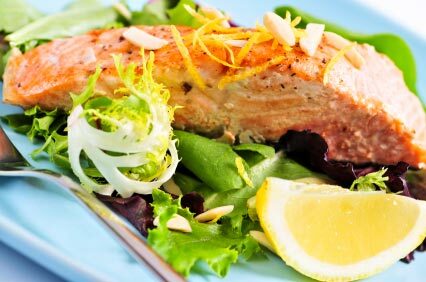 Wash and dry all the salad leaves and arrange them on each plate, then top with a slice of the salmon fillet and a wedge of lemon alongside. Serve some rhick, mustardy French dressing separately for each person to drizzle over the leaves. Want to taste the best wild salmon cooked to perfection? Visit Loch Fyne restaurant in Nottingham to taste their excellent fish dishes.